The process of finding and evaluating existing clinical research is central to all areas of biomedicine, providing the foundations upon which the entire Evidence Based Medicine paradigm is built. Medical literature is at the heart of clinical decision making, policy development, clinical research, medical education and the discovery and development of therapeutics. However, the process of effectively finding medical evidence within the literature is lengthy and inefficient, often requiring researchers to spend many hours on the literature search procedure. Searching the biomedical literature traditionally requires the user to manually input search terms into a citation database, such as PubMed. The search results are typically very large and imprecise, requiring a lengthy screening process in order to find the relevant evidence. In our example, the search returns 17,046 results. This can of course be narrowed down and restricted, but nevertheless represents a huge body of literature that the researchers would have to engage with. Many of the retrieved papers will be false positives, and the research team would have to spend many hours screening these documents in order to find the evidence that answers the research question. 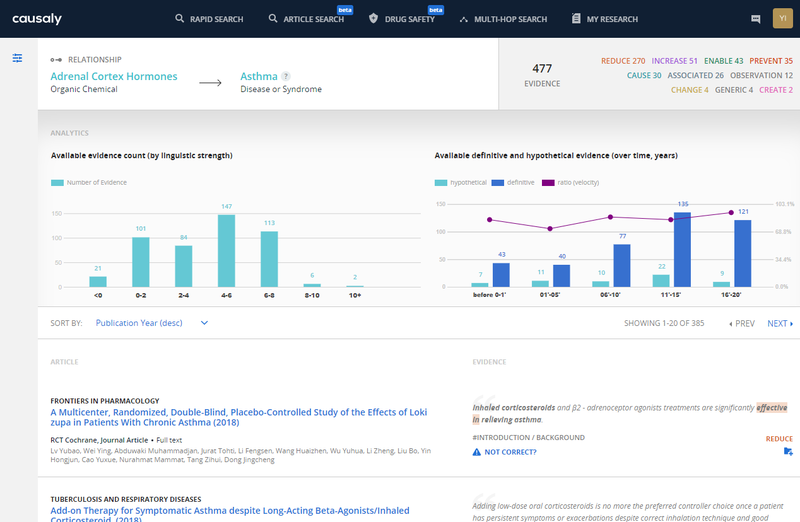 The AI techniques used by Causaly can address this issue and speed up the evidence search, allowing clinical and academic researchers to focus on other more productive areas. By using machine-learning algorithms and natural language processing technologies, Causaly is able to uncover relationships between concepts that are otherwise hidden within the evidence. This is because the information retrieval system is able to analyse the semantic context of the search terms and can therefore highlight sophisticated causal relationships between variables, something not possible using traditional methods. The search is precise, retrieving a manageable and focused set of results totalling 477 papers. 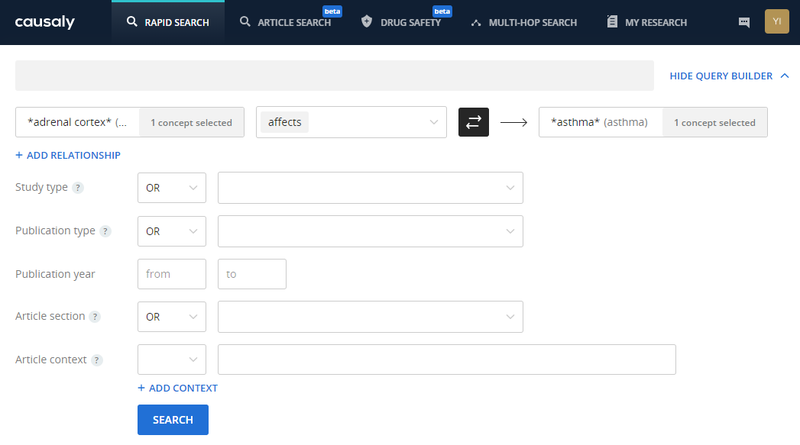 Whilst PubMed retrieved all of the literature that mentions both corticosteroids and asthma (over 17,000 papers), Causaly is able to automatically restrict the search to that literature which explicitly describes how corticosteroids affect asthma. This directly retrieves only the relevant evidence that answers the research question, negating the labour intensive need for researchers to manually screen the full body of literature. Causaly directly answers the research question by uncovering and categorising the different ways that corticosteroids affect asthma. In our example, Causaly finds and links to evidence suggesting that corticosteroids may reduce, increase, enable or prevent asthma, and the researcher is able to explore each relationship and the evidence that supports these findings. We can see in our example that the large majority of evidence suggests that corticosteroids reduce asthma, but that some evidence might suggest otherwise. For each retrieved article, standard citation information is presented much like in a traditional PubMed search. However, alongside this information Causaly also directly displays the statement from within the article text that supports the identified relationship. Rather than simply providing the citation data, Causaly brings the researcher directly to the heart of the evidence. As an example, one search result highlights that, ‘although corticosteroids have proven clinical efficacy in asthma, many asthmatic inflammatory conditions are not responsive to corticosteroids’. The researcher is able to quickly scan through the search results to find actual qualitative evidence such as this, which directly answers the research question. These insights were revealed within seconds. Comparable insights gleaned from a traditional PubMed search would take many hours or even days to complete, as the researchers are forced to screen and analyse the vast body of literature retrieved during the search process. Causaly also offers the expected filter mechanisms such as publication type and study type. Because the system is built on machine-reading techniques, Causaly is able to filter the relationships based upon where in the article they emerge, for example in the Introduction or in the Conclusion, which might impact on evaluations of the strength and reliability of the relationship. These sophisticated functions are not possible in traditional literature searching. Artificial Intelligence technologies can significantly enhance the literature searching process, offering methods to quickly explore the literature in depth and in specific causal contexts. Traditional searching is unable to discover relationships between concepts in the literature, other than that they appear together in the retrieved research. Artificial Intelligence tools can go beyond this, speedily uncovering cause and affect evidence otherwise hidden in the huge body of medical literature. Using AI technologies to effectively screen out the noise of literature searching saves a large amount of time and resources, which researchers and research organisations can better invest elsewhere.